It is our mission as a Tampa Mold Inspection & testing Company is to make our clients’ home and work environment cleaner, safer and more comfortable. Suncoast Inspections.com identifies and classifies multiple health hazards relating to bio-toxins (molds, fungi) associated with negatively affecting human health. All pathogenic and allergenic testing is analyzed by a nationally certified laboratory. Suncoast Inspections.com provides its clients with the confidence and assurance that the environment is safe when all work is completed. Whether you have a specific problem area or need the entire structure evaluated, Suncoast Inspections has the flexibility to meet your needs. Our clients get the expertise of a professional mold inspector along with the forensic building inspection expertise that only comes with 25 years of building inspection experience. We can diagnose your sick building syndrome. All data is kept confidential. Once the mold inspection process is complete, Suncoast Inspections.com reviews the preliminary findings with the client(s), only then, with their approval, will we perform the appropriate biological collection protocol. These initial tests, which may include, air, swab or bulk, not only confirm the presence of mold but also create a base line which will be needed or used at a later date during clearance testing. Suncoast Inspections.com does not perform mold remediation as it is our belief to do so would be unethical and a conflict of interest. We are an investigative and testing firm only. Suncoast Inspections.com provides its clients with the names of local competent mold remediation contractors upon request. Some of these companies now provide warrantees against future mold growth. When remediation is complete, Suncoast Inspections.com will perform clearance testing (re-test) the treated areas, analyze the data and provide a conclusion to the process. The problem of mold has been around for centuries. As you will read below, the method and necessity of removing mold has changed very little in 3500 years. We still must locate and eliminate the moisture source and remove the contaminated materials. However, our ability to identify invisible toxic spores and take the necessary steps to remediate, has vastly improved. In today’s world, a case like this is extremely rare. The important thing to remember is if mold is addressed when moisture appears, it drastically limits the scope of the remediation. Molds can generally be divided into 3 groups based on their health effects: Allergenic, Pathogenic and Toxic. There are many Allergenic molds that can cause allergenic or asthmatic symptoms such as wheezing or runny nose. These molds do not usually produce life-threatening effects, but are problematic for those who are already allergenic or asthmatic. Pathogenic mold can cause serious health effects in persons with decreased immune function, taking chemotherapy, or with HIV/AIDS. Some pathogens are common. A normal, healthy individual can probably resist infection by these, but high exposures may cause reactions in the lungs. Toxins are poisonous substances produced by living things. Those from mold (called Mycotoxins) can cause serious health effects in almost anyone. These effects may be short-term irritations, immune system problems, and even cancer. Most of the diseases caused by Mycotoxins involve ingestion of contaminated food. Mycotoxins are contained in certain varieties of fungus spores, and these can be breathed into the body. Mold can grow in any environment. HVAC systems are like “incubators” for mold. If left alone, they can end up like this. An extensive water event on the floor above the apartment can cause mold to grow on the walls and ceiling. 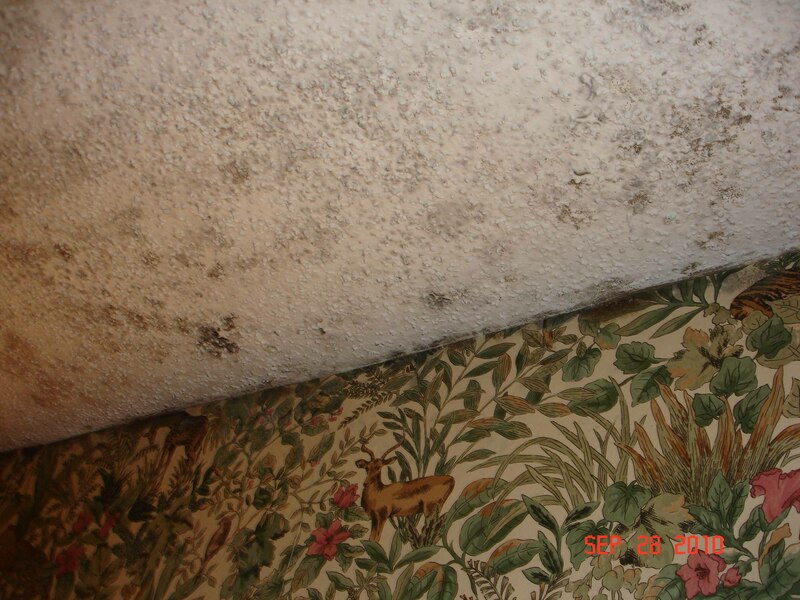 Molds are microscopic fungi that live on plant or animal matter. No one knows how many species of fungi exist but estimates range from tens of thousands to perhaps three hundred thousand or more. Most are filamentous organisms and the production of spores is characteristic of fungi in general. These spores can be air, water, or insect-borne. What are some of the common indoor molds/fungi? How do molds/fungi affect people? Some people are sensitive to molds. For these people, exposure to molds can cause symptoms such as nasal stuffiness, eye irritation, or wheezing. Some people, such as those with serious allergies to molds, may have more severe reactions. Severe reactions may occur among workers exposed to large amounts of molds in occupational settings, such as office buildings, farmers working around moldy hay. Severe reactions may include fever and shortness of breath. People with chronic illnesses, such as obstructive lung disease, may develop mold infections in their lungs. If you think you have sensitivities or anyone in your family has documented sensitivities to Mold/Fungi we high recommend testing by the appropriate health professionals. Molds are found in virtually every environment and can be detected, both indoors and outdoors, year round. Mold growth is encouraged by warm and humid conditions (Florida) and can grow on virtually any surface, if moisture is present. Outdoors, they can be found in shady, damp areas or places where leaves or other vegetation is decomposing. Indoors, they can be found where humidity levels are high, such as basements (not many in Florida) or showers. They can also be present in drywall where you may have experienced a water leak, i.e. a roof leak, wall or window & door leaks. Particle board used in cabinetry is very prone to mold growth mostly under sink areas. How can people decrease mold/fungi exposure? Sensitive individuals should avoid areas that are likely to have mold, such as compost piles, cut grass, and wooded areas. Inside homes, mold growth can be slowed by keeping relative humidity levels at 50% or below and ventilating showers and cooking areas. We highly recommend dehumidifiers for those living in tropical or high humidity climates or problematic buildings. A dehumidifier can be placed in the master bath or kitchen area and turned on for a few hours a day. Mold growth can be removed on hard surfaces (glass, tile, metal) with commercial products or a weak bleach solution (1 cup of bleach in 1 gallon of water and a mild soap). Mold cannot be removed from drywall. Drywall must be removed and replaced. In situations where mold exposure is unavoidable, sensitive people should wear a tight-fitting face mask. Simply starting the drying process of wet or damp building materials and furnishings within 24-48 hours will prevent mold growth. This is extremely important. If the water event is large, call in a remediation professional to dry the building materials with commercial dehumidifiers and blowers. Keep the humidity level in the house at 50% or lower. Use an air conditioner or supplement with a dehumidifier during humid months. Be sure the home has adequate ventilation, including exhaust fans in kitchen, bathrooms and attics. Do not carpet bathrooms and basements. Mold cannot be removed from carpet. Clean the walls prior to painting with a paint sensitive cleaning wash to remove dust, debris and oils in kitchens. One product call “Krud Kleaner” works very well. Which areas have high mold exposures? Central Air Conditioning Systems – HVAC – SI.com will inspect inside the HVAC system (most companies will not). The key to mold control is moisture control. It is important to dry water damaged areas and items within 24 to 48 hours to prevent mold growth. If mold is a problem in your home, clean up the mold and get rid of the excess water or moisture (find the source). Fix the leaking plumbing or other sources of water. Wash mold off hard surfaces with detergent and water (with a little bleach) and dry completely. Absorbent materials (such as ceiling tiles and carpet) that become moldy must be replaced. 1. I heard about toxic molds that grow in homes and other buildings. Should I be concerned about a serious health risk to me and my family? The hazards presented by molds that may contain Mycotoxins should be considered the same as other common molds which can grow in your house. There is always a little mold everywhere – in the air and on many surfaces. 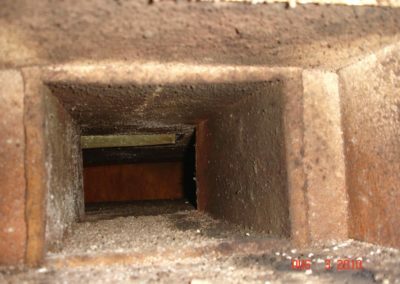 There are very few case reports that toxic molds (those containing certain Mycotoxins) inside homes can cause unique or rare health conditions such as pulmonary hemorrhage or memory loss. These case reports are rare, and a causal link between the presence of the toxic mold and these conditions has not been proven. A common-sense approach should be used for any mold contamination existing inside buildings and homes. The common health concerns from molds include hay fever-like allergic symptoms. Certain individuals with chronic respiratory disease (chronic obstructive pulmonary disorder, asthma) may experience difficulty breathing. Individuals with immune suppression may be at increased risk for infection from molds. If you or your family members have these conditions, a qualified medical professional should be consulted for diagnosis and treatment. For the most part, one should take routine measures to prevent mold growth in the home. If you think you have sensitivities or anyone in your family has documented sensitivities to Mold/Fungi we high recommend testing by the appropriate health professionals. 2. How common is mold, including Stachybotrys Chartarum (also known by its synonym Stachybotrys atra) in buildings? Molds are very common in buildings and homes and will grow anywhere indoors where there is moisture. The most common indoor molds are Cladosporium, Penicillium, Aspergillus, and Alternaria. We do not have accurate information about how often Stachybotrys Chartarum is found in buildings and homes. While it is less common than other mold species, it is not rare. 3. How do molds/fungi get in the indoor environment and how do they grow? Molds naturally grow in the indoor environment. Mold spores may also enter your house through open doorways, windows, heating, ventilation, air conditioning systems, shoes and pets. Spores in the air outside also attach themselves to people and animals, making clothing, shoes, bags, and pet’s convenient vehicles for carrying mold indoors. Imagine your pet rolling in the grass and then coming in to sleep on sofas and beds. When mold spores drop on places where there is excessive moisture, such as where leakage may have occurred in roofs, pipes, walls, plant pots, or where there has been flooding, they will grow. Many building materials provide suitable nutrients that encourage mold to grow. Wet cellulose materials, including paper and paper products, drywall, cardboard, ceiling tiles, wood, and wood products, are particularly conducive for the growth of some molds. Other materials such as dust, paints, wallpaper, insulation materials, carpet, fabric, and upholstery, commonly support mold growth. 4. What is Stachybotrys Chartarum (Stachybotrys atra)? Stachybotrys Chartarum (also known by its synonym Stachybotrys atra) can be a greenish-black mold. It can grow on material with a high cellulose and low nitrogen content, such as fiberboard, gypsum board, paper, dust, and lint. Growth occurs when there is moisture from water damage, excessive humidity, water leaks, condensation, water infiltration, or flooding. Constant moisture is required for its growth. It is not necessary, however, to determine what type of mold you may have. All molds should be treated the same with respect to potential health risks and removal. Our experience at SI.com, testing has shown a pattern of toxic molds in areas where repetitive moisture exists over a long period of time. 5. Are there any circumstances where people should vacate a home or other building because of mold? These decisions have to be made individually. If you believe you are ill because of exposure to mold in a building, you should have the building inspected and tested and consult your physician to determine the appropriate action to take. 6. Who are the people who are most at risk for health problems associated with exposure to mold? 7. How do you know if you have a mold problem? 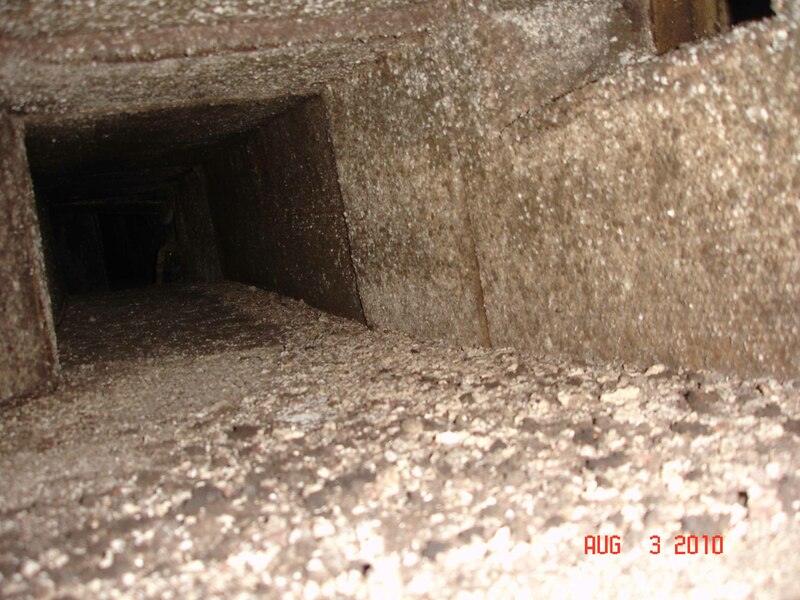 Large mold infestations can usually be seen and off gas a significant noticeable musty odor. 8. Does Stachybotrys Chartarum (Stachybotrys atra) cause acute idiopathic pulmonary hemorrhage among infants? To date, a possible association between acute idiopathic pulmonary hemorrhage among infants and Stachybotrys Chartarum (Stachybotrys atra) has not been proven. Further studies are needed to determine what causes acute idiopathic hemorrhage. 9. What are the potential health effects of mold in buildings and homes? Mold/Fungi exposure does not always present a health problem indoors. However, some people are sensitive to molds/fungi. These people may experience symptoms such as nasal stuffiness, eye irritation, or wheezing when exposed. Some people may have more severe reactions which may occur among workers exposed to large amounts of molds in occupational settings, office buildings, and farmers working around moldy hay. Severe reactions may include fever and shortness of breath. People with chronic illnesses, such as obstructive lung disease, may develop mold/fungi infections in their lungs. 10. What should people to do if they determine they have Stachybotrys Chartarum (Stachybotrys atra) in their buildings or homes? Mold growing in buildings, whether it is Stachybotrys Chartarum (Stachybotrys atra) or other molds/fungi, indicates there is a problem somewhere with water or moisture. Address the source first, stop the water or moisture. Mold can be cleaned off hard surfaces (metal, tile, grout, metal etc.) with a weak bleach/soap solution, this is the only time when bleach is acceptable. Do not use bleach anywhere else. Today there are over the counter antimicrobial cleaners available (make sure they are EPA certified). Mold under carpets typically requires that the carpets be removed and replaced. Once mold starts to grow in insulation or wallboard the only way to deal with the problem is to remove and replace. There are containment concerns, negative and fresh air issues precautions that must be addressed with the remediation of Stachybotrys Chartarum (Stachybotrys atra), than with other molds. In areas where flooding has occurred, prompt removal of finish materials is recommended. Moldy items should be discarded. 11. I found mold growing in my home; how do I test the mold? Contact Suncoast Inspections.com for Testing & Sample Services. Samples must be taken by a state licensed professional. In summary, Stachybotrys Chartarum (Stachybotrys atra) and other molds may cause health symptoms that are nonspecific. At present there is no test that proves an association between Stachybotrys Chartarum (Stachybotrys atra) and particular health symptoms. Individuals with persistent symptoms should see their medical professional. However, if Stachybotrys Chartarum (Stachybotrys atra) or other molds are found in a building, prudent practice recommends it be removed. Use the simplest and most expedient method that properly and safely removes mold. Portions of the above information was provided by The Center for Disease Control & ESA (Environmental Solutions Association). 1. Is indoor mold a real problem or just hype? Mold spores are always present in typical indoor environments, and we are all exposed to them continuously. But, because of how buildings are being built today (tighter, less air infiltration and close attention to the building envelope), there is a much greater chance of encountering an excessive amount of mold in our indoor environment. The excessive growth of mold indoors is called “amplification.” So, the amplification of indoor mold is the problem; and many experts think that has increased significantly in the past 25 years. If you think you have sensitivities or anyone in your family has documented sensitivities to Mold/Fungi we high recommend testing by the appropriate health professionals. 2. What conditions promote mold growth indoors? Mold/Fungi follows moisture, it is that simple. Four of five requirements for mold growth (mold/fungi spores, oxygen, nutrients, and a suitable temperature) are present in most indoor environments. 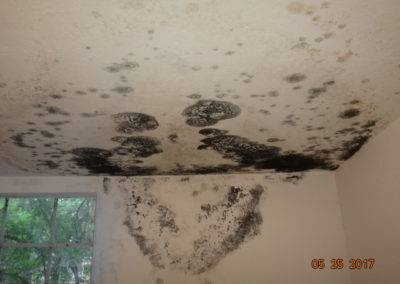 Therefore, when water or elevated moisture or humidity is added to the indoor environment, mold can begin to grow. Since mold follows moisture, any potential mold growth would likely be confined to the affected area. In severe cases, SI.com has encountered bacteria in addition to mold/fungi. Excessive amounts of water, either liquid H2O (water) or high relative humidity levels, can promote mold growth. Relative humidity refers to the amount of moisture in the air. When the relative humidity indoors remains above 65% for extended periods, mold growth can occur. So what about carpet lying on a moist concrete floor slab? The amount of moisture in the indoor air (relative humidity) might be normal, while the moisture content of the carpet could be well above the amount required for mold growth. Therefore, the moisture content of the effected material (measured with a moisture meter, for example) is often critical in promoting mold growth. Make sure your consultant understands the difference between relative humidity and moisture content; and that they use a moisture meter or measuring device in their inspections. 3. How long does it take for mold to grow on wet materials? Immediately after water intrusion incident, the affected materials are just wet, not moldy. It takes 24-48 hours for mold to start growing. Different molds grow at different rates and under different conditions of moisture and temperature. However, as a rule of thumb, it takes about two to three days for mold to start growing on wet material (like drywall). One can then expect mold to become visible in three to five days. If the wet materials are removed and discarded, and/or adequately dried in place within that initial time period, there will probably not be a mold problem. The important thing to remember is to dry out the material immediately. This is an important point. Mold unlike asbestos, is a living organism, how quickly one responds can significantly affect overall cost of the response. An example of what can happen: An owner of a commercial building negotiated with the insurance company for 3 months before an effective response occurred. What was an initial $500,000.00 remediation became a $5,000,000.00 remediation due to the delay in responding. 4. We all have had mold in showers and tubs. We just wipe it off with some diluted bleach and soap. Isn't that enough? When it’s the shower that’s probably all you need. You know why there is visible mold in the shower. But that’s not what mold consultants speak of when they talk of a mold problem. Indoor mold growth occurs because there is an underlying structural, plumbing or mechanical problem that’s allowing water, moisture or humidity to intrude into a building. Mold growth can be a result or an indicator of a much larger problem. Those problems will continue to degrade the structure and the indoor environment until they are identified and fixed. This is the number one reason to hire a mold consultant with a strong construction background. It is important to remember there are no national standards that say a certain number of spores are hazardous. Removal with bleach has come under scrutiny recently. It is said this just knocks off the spores and leaves the hyphae to grow again or on the reverse side of the material. Wiping it off with a bleach and water solution is no longer acceptable in porous materials. If you are unsure if mold exists Suncoast Inspections.com, Inc. can inspect, perform tests, find the source of the moisture and recommend a course of action. With Suncoast Inspections.com, Inc. you get a building and mold inspector in one. Which wall cavities should be sampled? What about the sample volume? What are we looking for in wall cavities? How should wall cavities be sampled? To assess whether or not hidden fungal reservoirs are affecting the indoor environment. SI.com Note: Samples could also include removal of a small section of finish material to be sent to the lab. 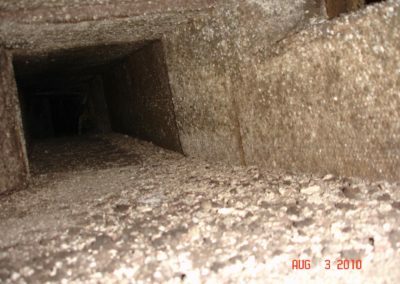 The primary reason to do wall cavity sampling is that it is more likely to encounter hidden fungal reservoirs than visible mold growth during an investigation. Probably more than four out of five houses that we investigate do not have any visible mold, whereas probably two out of three houses have hidden water intrusion mold. Yet, even though the mold is hidden, the client was still concerned enough to ask for an investigation. Many water intrusions that result in mold growth initially involve wall cavities and other inaccessible areas of the structure. The mold remains hidden from view, and it only becomes visible if the mold happens to grow through the drywall or other material. The second reason is to locate areas of both current, as well as past, water intrusion. Although I am sampling for mold, mold follows moisture. 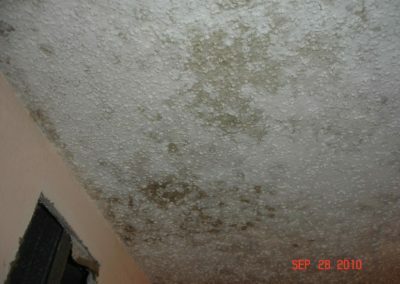 Therefore, mold can be used as a surrogate for moisture. For example, suppose a homeowner states that during the last rain, a significant leak occurred in the living room window. However, if the last rain was six months ago, the wall will be dry, and a moisture meter is not going to be very useful in verifying that the leak occurred. However, if significant amounts of water did enter the wall cavity during the last rain, there is a good chance that detectable amounts of mold spores will still be present in the wall cavity under the window. The third reason why I collect wall cavity samples is to identify the most productive sites for destructive testing; and, to confirm the results of the destructive testing. Destructive testing is relatively expensive, it disrupts the occupants living environment, and it may be subject to false negatives. Therefore, in many mold investigations, it is used sparingly. I recently performed a mold investigation on a house that had 118 windows, some of which leaked. Using wall cavity sampling, it was possible to identify a group of windows for destructive testing. This was accomplished at a relatively small cost, and minimized both the disruption and cost of the destructive testing by “pre-qualifying” the test sites. 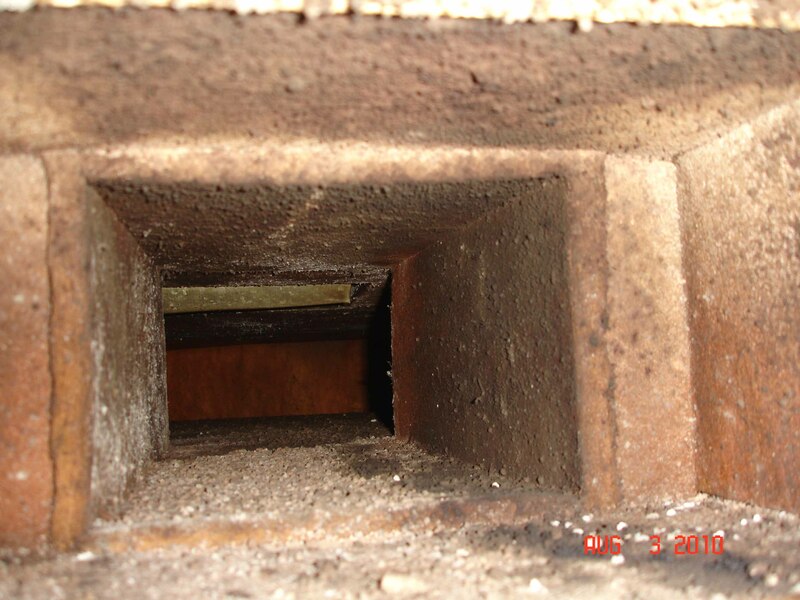 The fourth reason for sampling wall cavities is to assist the occupants in fulfilling their objectives. I may be asked to define a scope of remediation, help them obtain legal assistance, or assess the effectiveness of a recently completed mold restoration (as opposed to a mold remediation). It’s my experience that wall cavity samples are generally required to adequately accomplish each of these tasks. For example, it is not unusual to sample directly in the drying holes cut in walls and toe kicks while drying the materials in place, and to then detect significant amounts of mold spores inside those cavities. Unfortunately, those drying holes provide an open pathway between the fungal reservoirs and the breathing zones of the occupants. Question: During a restoration, why not use simple multi-port plastic manifolds to blow dry air into the bottom of a wet wall cavity and a similar manifold to exhaust the moist, contaminated air outdoors? The fifth reason to collect wall cavity samples is to assess whether or not hidden fungal reservoirs are affecting the indoor environment. One study has concluded that fungi contained in intact wall cavities sometimes enter the indoor air [Morey,P,Andrew,M,Ligman,B,Jarvis,J. Hidden Mold Sometimes Enters the Indoor Air. In Indoor Air 2002: Proceedings of the 9th International Conference on Indoor Air Quality and Climate, Vol. 2, H Levin, ed., Indoor Air 2002, Santa Cruz, California, 2002, pp.455-460]. Plumbing walls: Behind showers, toilets, sinks, laundries, wet bars. Base cabinets: The toe kick area under base cabinets that have been wet. Planter boxes: Adjoining perimeter walls. Exterior wall: Large cracks, areas lacking drainage (covered weep screed, etc. ), nonporous wall covering, sub-grade walls. Irrigation problems: Visible problems, high soil, poor drainage, etc. Restoration: Areas of inadequate remediation. This is not an exhaustive list of potential sampling locations, but they do indicate the types of locations in which wall cavity sampling may prove useful. Has a low airflow rate to avoid the collection of heavy debris loadings, combined with a low sample volume to minimize sampling bias. The Bi-Air cassette, which is the sampling device that we use, has all of these characteristics, because I designed it to have these characteristics. Other than bulk samples, it is probably the most common type of sample that our staff collects. It can be used to identify areas that are currently wet, and those that were previously wet. It can be used to pre-select areas for destructive testing, prepare a scope of remediation, and assess the effectiveness of “restored” areas. These tasks can be accomplished at a reasonable cost and without disrupting the indoor environment. This article originally appeared in the November 2003 issue of HarrisMartin’s COLUMNS-Mold, Vol. 3, No.1 www.harrismartin.com Reprinted with permission. * SI.com assesses every condition on an individual basis providing their clients with the necessary information to make an informative, educated decision on sampling possible mold locations. We recommend wall cavity samples after assessing the current conditions when other testing methods are not possible or permitted. The follow are suggestions from information compiled from performing mold inspections throughout the Tampa Bay area, from continuing education and IAQA articles. 1. Keep your home or office clean. So many time we go to clients’ homes or offices to find them in poor condition from the lack of daily or weekly cleaning. All the dust, debris, food particles, spilled liquids which collect become food for mold growth. If you see mold on your metal frame windows it is from dust collecting (the food) coming in contact with moisture (condensation). You must clean your windows. 2. Change the HVAC filters on a regular basis. This is very important to maintaining the health and well being of your indoor environment. Use the higher medium pleated filters with a MERV rating of 8 or more. 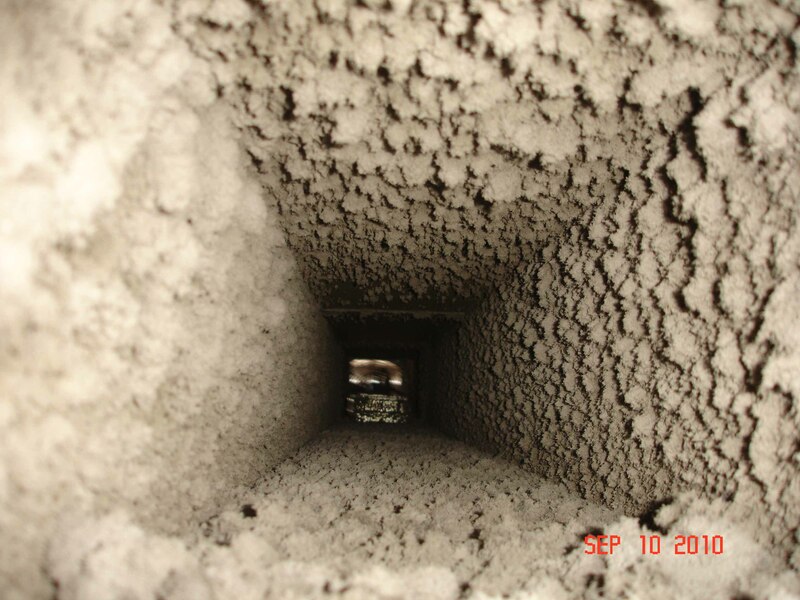 The filters remove the debris and particles in the air that otherwise would collect in the return ductwork, evaporator coil, air handler housing and eventually the supply ducts. 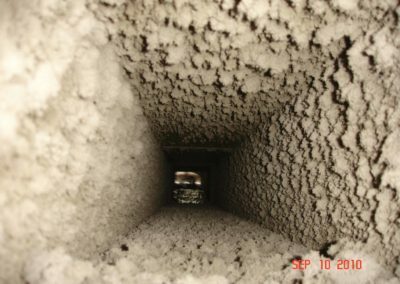 The particles and debris are the food source for the mold and the evaporator coil provides the moisture. 3. Install UV light(s) in the supply and return ductwork. Placing them in the equipment may void warranties. UV (ultraviolet) radiation is a safe non-chemical method of ridding homes of mold, viruses, bacteria and dust mites. The UV ray breaks through the cell wall of the organism, damaging the DNA and rendering the organism inert and unable to reproduce. Warning – UV lights are intense and can damage eyes and skin. Eye exposure of 30 seconds can feel like a full day exposure in the sun and cause temporary blurring/blindness which will require medical attention. Replacement is required annually even if not burnt out. 4. If a leak occurs, dry it out. Purchase a house hold dehumidifier. Materials used in construction and home furnishings are possible food source for mold when they come in contact with moisture or water. A dehumidifier provide the occupant with a means to extract the moisture quickly before mold growth begins. You have 48 hours to dry things out before mold begins to grow. These units are capable of handling small leaks and high room humidity conditions. They are not for a massive water leak. Should one occur call a profession drying company ASAP. Using a dehumidifier in the master bathroom on a regular basis will dry the room out and lesson the burden on your HVAC system. In our subtropical Florida Environment it does not hurt to run the dehumidifier on the regular basis. Just as in a drier climate a humidifier may be needed. 5. Keep your shower clean and free of mold growth. No one likes to clean the shower but it requires a bi-weekly or monthly cleaning (depending on usage) using a scrub brush, detergent and chlorine bleach. Be careful chlorine bleach has intense fumes which can cause other problems if the room is not well ventilated. Open the windows, turn the HVAC system on, run a fan and wear appropriate breathing and skin protection devises. Sources: Article: An Interview with Mark Valenziano, BreatheClean President & CEO in the January/February 2008 NADCA Ductales Annual Report. Shenassa and his team are conducting follow-up research to see if mold does, indeed, directly cause depression. Shenassa said that given the results of the current study, he wouldn’t be surprised if there is a cause-and-effect association. Molds are toxins, and some research has indicated that these toxins can affect the nervous system or the immune system or impede the function of the frontal cortex, the part of the brain that plays a part in impulse control, memory, problem solving, socialization and spontaneity.